Kutta was working herself into a fine state of annoyance, though she wouldn’t admit it. “I’m not angry,” she had snapped, when Mhumhi had posed a tentative question. Then she had glared over at Mini and walked to the opposite side of the metal room and sat down with her head to the wall. Mini herself had fallen into a kind of semi-sleep, her head down and the tip of her tongue sticking out between her jaws. The screamers were all still hovering around her, leaning close and making sniffing noises. It was a bit creepy. Vimbo was lying on his side underneath the table, a dark mass. Mhumhi saw Kutta, still with her nose towards the wall, shiver a little. He went to sit close beside her, leaning against her shoulder. Kutta turned an ear back towards him. She lowered her voice. “Of course not! I-” She hesitated, seeming to realize that her voice had pitched louder on the last statement. Vimbo’s head had come up under the table, his eyes taking on a yellowish gleam in the gloom. Kutta spoke more softly again. Kutta turned her head and gave him a sharp nip on the cheek. He flinched. Mhumhi gave her a sour look, lowering his head so he could rub at his sore cheek with his wrist. Kutta eyed him. Kutta gave a sharp huff through her nose, but they had to suspend their conversation then, for a heavy, moist breath fell across their backs. It was Vimbo, standing behind them, staring blackly. Mhumhi turned around slowly. He hesitated, for Mini was still sleeping, and he got the sense it’d be best not to wake her. Vimbo followed his gaze and gave a kind of grunt-whine. “The hulkers upstairs should be able to talk to him,” Mhumhi pointed out. “How, though?” Mhumhi felt half-amused, imagining the hyena and the human going tooth-to-tooth. Kutta wrinkled her brow, looking at Vimbo. Mhumhi couldn’t help but feel in uneasy agreement with this. He eyed Vimbo again and noticed for the first time that there was a small amount of crusty dried blood matting the fur around his lips. And when had that got there? Vimbo seemed eager to have his full attention again, and turned his head sharply to look back at the stairs. “Yes, leave the invalid here,” came Mini’s thin, pitiable voice. Kutta sent a furious look in the direction of the table. “Don’t nap too deeply,” said Mhumhi, and she gave a dry little whuff. They followed Vimbo back up the stairs to the first floor, leaving Mini lying on the table in the cold room, with all the screamers surrounding her- all but one. The female they had taken with them from the third floor had followed them, and now sprang ahead to hold open the door to the hall for them, giving them the benefit of a broad, gap-toothed grin. Kutta waved her tail at the sight of it, and Vimbo, his paws on the next set of stairs, turned his head back. Mhumhi examined the screamer’s black eyes and felt more dubious in this respect, but there was an empty sweetness to her. “Maybe we ought to give her a name,” said Kutta, in half-jesting way, except she was looking up at the screamer’s face with her head half-tilted and her eyes soft. Vimbo gave a grunt, and for a half-second Mhumhi thought he was indignant over the description before he recalled that Vimbo had no idea what they were saying. The hyena was jerking his head impatiently up the stairs. “Vimbo wants us to go,” said Mhumhi. “I don’t recall him being the leader of this expedition,” said Kutta. She went over to the screamer, tail wagging, and into the hallway. The door swung shut behind them. Vimbo and Mhumhi exchanged a glance, and then Mhumhi swished his tail and went after his sister, pushing the door open again with his forepaws. Predictably, Kutta was already in the midst of a massive hug from the screamer, which was crouching and making cooing noises of appreciation, but this time Kutta was reciprocating, licking the screamer’s forehead the way she would have for Tareq’s. “Kutta,” said Mhumhi, going a little stiff. “We should give her a name,” Kutta insisted, and extracted herself from the screamer’s grip, wagging. She put her forepaws on the screamer’s shoulders and rubbed her forehead against its face. “Is this why you wanted to bring it with us?” Mhumhi challenged, not sure whether he ought to feel amused or irritated. Mhumhi gave a snort of dissent, stepping closer. The screamer reached for him, smiling, her palm raised and flat. Mhumhi studied the leathery skin on it, then looked back at the hulker’s face. On the brown skin under her eyes were tiny darker marks that gave her a peppered appearance. 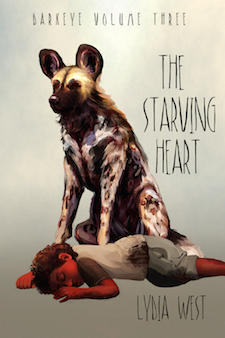 Mhumhi felt a sort of squirm in his gut, because they were a little bit charming. “Dot,” said Kutta. Mhumhi pulled his gaze away from the screamer’s marks to look at her. Mhumhi sighed through her nose. The possibly-named Dot stretched out her hand as far as it would go, teetering on her ankles, and gave his muzzle a little pat. The door behind them came open with a clatter, and Vimbo pushed his head out. He gave a low whoop. “Maybe he smells the dead cow,” said Mhumhi, and saw Kutta go a little stiff. Apparently she had forgotten it. “He’s welcome to go on his own and eat it,” she said. Mhumhi dropped his head so that he wouldn’t have to meet her gaze directly. All of his earlier animosity towards Vimbo had indeed evaporated, and he’d be hard-pressed to say exactly why. “He’s not really harming anyone,” he said, weakly. Vimbo gave a bounce and a grunt when they started approaching him, and vanished back behind the door. Dot got back up onto her hind legs and ran to hold it open again, her face blank and happy, as if it were her life’s ambition to please them. “That’s very good, Dot,” Kutta informed her, as they passed, and Dot gave her kind of a wet, adoring gaze. Mhumhi felt alarmed by the speed with which such gestures were starting to look endearing to him. They followed Vimbo, who was walking up the stairs with a definite sense of purpose; he did not so much as stop and sniff when they passed the floor with the dead cow, nor when they passed the hall where the screamers had been residing. He kept going upwards, stumping with his heavy paws. Mhumhi watched his spotted back and felt a trickle of anxiety. “Do you think he knows something?” he asked Kutta. “We don’t know anything about what he knows, really,” said Kutta, which did not comfort him. Vimbo stopped and looked back at him, his clownish broad nose and his round eyes telling them nothing, as usual. He had stopped in front of the door to the floor where O and Henli had been. “I guess he thinks we should go ahead,” said Kutta, turning her ears back and looking at Mhumhi. Mhumhi began to step forward, then paused as Dot went by at lightning speed to open the door again. Vimbo’s head followed her. Mhumhi went after her, making a wide berth around Vimbo, who had lowered his head, mouth slightly open. As soon as he stepped onto the dull brown carpet in the hallway, his sense of unease worsened. He pricked his ears forward, trying to gauge what was wrong, and then he realized it was what he wasn’t sensing that was bothering him. They had left O and Henli and the rest of the screamers out in the hall, and now they had all vanished somewhere. Kutta stepped forward, lowering her head to sniff a little. Mhumhi sniffed too, at the air, and swallowed. Kutta brought her head up slowly. The metallic tang was filling Mhumhi’s nostrils. “Hulker blood,” said Mhumhi, and quivered a little. Behind them, Vimbo gave a soft giggle. “It’s not-” began Kutta, and then swallowed. Mhumhi gave her a swift glance. Mhumhi trotted after her, for she had sprung ahead at a lope, turning her head from side to side as she passed each door. His own worry was beating against his breastbone, but surely… Surely Tareq had been all right. Surely he had not made another terrible mistake. Dot was following behind them all, taking long strides, her expression still calm and blissful. Kutta stopped in front of a room- it was the room with the couches, in fact, where Henli had invited them for a meal- and pawed the door open. “Oh,” said O, rising to her feet at the sight of them. Apparently she had been sitting on the couch, alone. “Where’s Tareq?” asked Kutta at once, casting all around. The bowls and the box of strange gelatinous cubes were still on the table. O seemed to waver on her feet, staring at them. She was looking behind them at Vimbo, who was standing in the doorway. His head was very low, and his ears back, as he stared at her. “There are no others,” said Mhumhi. She looked down at him. O gave him a vague smile. “Where’s Tareq?” said Kutta, her teeth flashing. O hesitated, then turned slightly to point at a door in the back of the room. It was the one Henli had come through with the box of cubes. She paused, looking at Vimbo in what seemed to be a slightly nervous way. “Tell us after we’ve seen Tareq,” snapped Kutta, raising her tail. “Mm, I should probably tell you first,” said O, watching as Mhumhi walked around the couch towards the door, his tail sticking straight back. The metallic scent of blood- he know sense that it was coming from behind that door. It had a handle on it, like their old front door in Oldtown. He pulled down and tugged with his paws. The blood smell got stronger. Behind the door was Henli, lying motionless on the floor. Blood was seeping from her scalp and into the carpet. She looked around the room at them, eyes wide with a kind of new conviction, and touched the side of her face. Dark liquid smeared on her cheek from her fingertips. “licking the screamer’s forehead the way she would have for Tareq’s.” I don’t think there should be a for there, before Tareq’s, but I’m not sure. “The metallic scent of blood- he know sense that it was coming from behind that door.” know sense? ahahahahaa. Oh, O. We’re all a bit mad here.